Colorino – not exactly a well-known grape. This wino had never heard of it before noticing it on a menu at Motorino (arguably NYC´s best pizza, although Nick´s gets my vote). When friends visit you in New York (hola xime), it´s these kinds of places that you have to show off – not just Wall Street, the High Line and the insufferable mayhem of Times Square. So Exacto and I met up after work with xime-amiga to show off one particularly tasty restaurant in one particularly food-friendly neighborhood. Motorino thankfully had a pretty fun and reasonable wine list, and Colorino sparked immediately attention thanks to its easy-to-pronounce grape name. Colorino, it turns out, is both easy to say and easy to remember. “Colorino” means colored and for a dark grape with red flesh (yes, that´s right – they exist! ), colored makes perfect sense. Photo by Lane Greer, Oklahoma State University. So, red flesh in grapes? Yeah, didn´t know that was a thing either. Most grapes that get turned into red wine have white flesh with a dark skin that turns the white flesh into red wine. However, there are a few grapes that manage to be red through and through. These are the despised and eminently mockable The Ohio State University (Go Blue! ), the lackluster Cincinnati Reds or the recent Big Ten debutantes, the Nebraska Cornhuskers. All red, all the way through – for better or for worse, but mostly for worse. 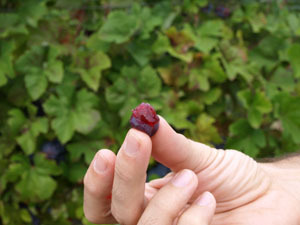 Colorino isn´t exactly the most famous of these red-fleshed, red-faced grapes. That honor goes to Alicante Bouschet (one of Portugual´s awesome grapes). Apparently, red-fleshed grapes are at least common enough to have their own unpronounceable French word – “Teinturier” – which includes Colorino, Alicante Bouschet, Saperavi and Dunkelfelder. Probably others too. What I thought… Medium body, medium dry, blackberries finish, blueberries taste. Ate it with pizza and worked really well. What experts think (since apparently we drank VERY different wines)… scents of ripe red berries, sweet flowers and pepper; taste is full bodied, with intense fruit and chocolate flavors and a very fine finish. Pairs with grilled food, pasta, meat and soft to medium cheeses (apparently, not with pizza – except it´s delicious that way). * La Spinetta means hill in the local Piedmontese language (sidebar: there´s a language in Piedmont other than Italian?). Not sure why a place in Tuscany is using a language from Piedmont but sure, they make good wine so no complaints. 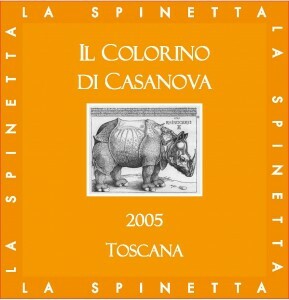 * Colorino is often used as a blending grape in Tuscany where it goes into the pot with Sangiovese. Think inky Petit Verdot in the Bordeaux blend and you´ve got the right idea of how it works in the Tuscan countryside. * Colorino shows up in those blending amounts of 5-10% in Chianti and also in Vino Nobile di Montepulcino, two of Tuscany´s most famous wines.